This first solo museum exhibition of the work of Brooklyn-based artist and designer Brian Donnelly, a.k.a. KAWS, includes his most recent paintings, sculptures, and drawings, as well as a survey of his iconic street art, apparel, product and graphic designs. 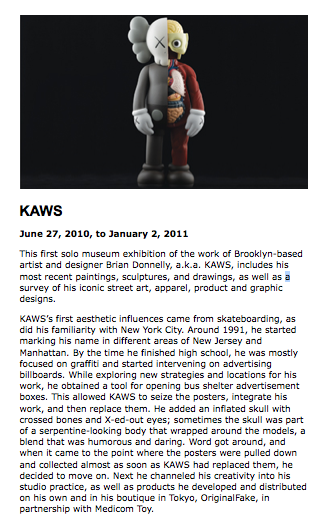 Most recently, KAWS has been exhibiting the art he has been making as a daily practice for some time. His new paintings and sculptures reflect the wit, irreverence, and even affection that he inflicts upon the infamous and iconic entertainment and marketing characters that he loves/hates. 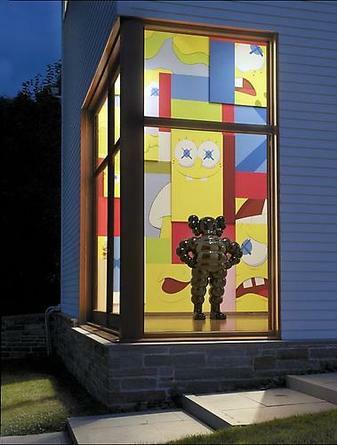 KAWS’s characters are highly charged, humorous and yet bittersweet. Although they are recognizable by and accessible to everyone, ultimately they both serve and criticize contemporary consumer culture. Click here to view the online exhibition brochure.